If you're interested in adopting a puppy-sized pet pig who will stay small forever, prepare for a harsh reality. Though the concept of an eternally tiny porcine pal may be cute, much of it is a myth, and it's easy to be fooled by irresponsible breeders making false promises. Still, smaller pigs suitable for keeping as pets do exist -- you just have to do your homework if you want to avoid raising a full-sized pig with an appetite to match. 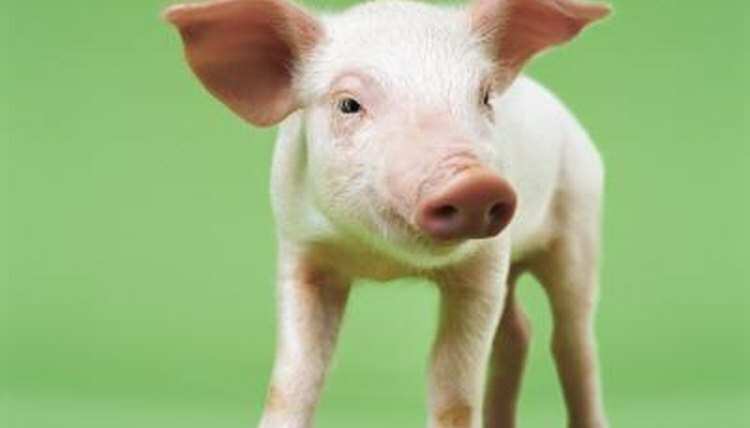 There is no such breed as a "teacup," "micro" or "miniature" pig. It simply does not exist. (All domesticated pigs, both those farmed for food and those kept as pets, are the same subspecies, Sus scrofa domesticus.) Breeders may use terms like these to describe the size of a pig, but adopting a "teacup" or "dandie" pig doesn't guarantee your pet will remain small. Many factors determine a pig's adult size, and two pigs who are the same size at birth may attain radically different sizes as they grow. Because the breed of the pig itself doesn't necessarily tell you whether he will remain small or balloon in size, you have to do your homework, and that means investigating his breeding. When you consider adopting a small pig, you must look at his pedigree, particularly his parents -- if he has older siblings from the same parents, size them, too. Pigs can begin mating at a young age, so only when his parents are fully grown can you begin to estimate his own adult size. This is not an exact science, but generally, if his parents are both smaller as full-grown adults, he will be, too. Keep in mind that pigs may continue to grow in size until age 6! You should always enquire about the lifestyle that the pigs enjoy, wherever you adopt. This is particularly important when you're adopting a smaller pig, because some breeders employ irresponsible methods of maintaining a small size. Sadly, some pigs are intentionally kept small by inbreeding or underfeeding, which reduces the quality and length of their lives. And even a responsible breeder who cares for her animals properly can't promise you that a given piglet won't grow to be 150 pounds or more. Ask yourself what you would do if your adorable pet got to be that size. Before you adopt a pig, research the time and energy that goes into properly caring for one. Despite their potential for domestication, small pigs still require extensive training, socialization and veterinary care. They may live for 15 years or longer, and when they aren't well trained, they can become destructive. Don't underestimate the power of a small pig, or the attention that they require.